Loblaw Companies is Canada's largest food retailer, bar none. Loblaws formerly retailed in the US as well, operating stores both under its own name (concentrated in the Lake Erie and Lake Ontario watersheds) and that of National Tea, a Chicago grocer acquired in 1955 that once had a footprint across the entirety of the American midwest and beyond. That National managed to squander its competitive standing is remarkable, but squander it did: The chain began paring itself back as early as the 1930s, and Loblaws was able to do little to stem the decline. 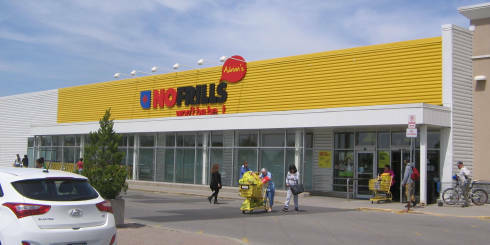 In Canada, Loblaws survived by cutting overhead and introducing No Frills and other low-priced concepts, often franchised. 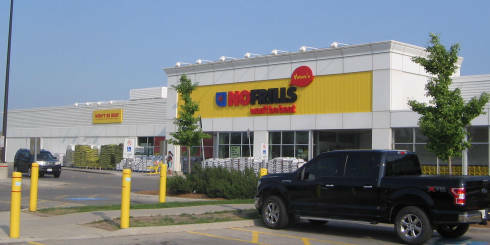 A disproportionate number of older Loblaws stores have survived in operation by being converted to No Frills or Valu-Mart stores, giving them an extra lease of life. 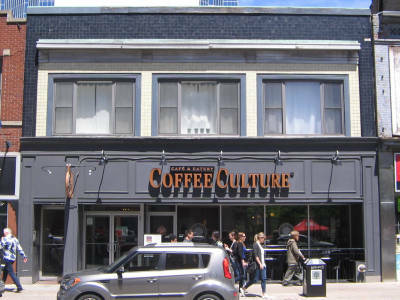 This unassuming storefront of two buildings cobbled together is an example of the type of retail edifice that National operated out of in its northern reaches 75 years ago. 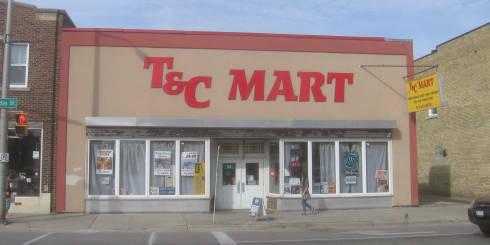 National Tea withdrew from northeast Wisconsin before the end of the 1940s, so this store never had the chance to operate for very long. 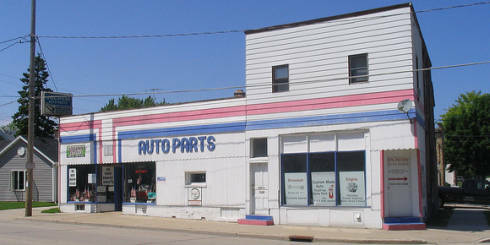 An example of a 1950s-era store bearing National's most recognizable architecture, characterized by a flat brick pylon over the entrance. A diamond-shaped sign would have originally been attached to both sides of this. I live in London, Ontario. Given the pervasiveness of Loblaws there, this section effectively serves as a capsule grocery history of the city...as well as places beyond. 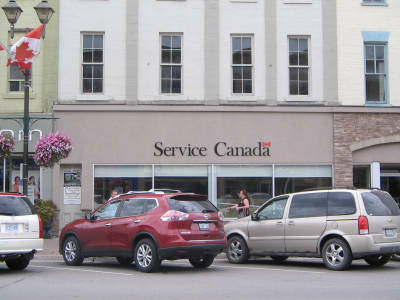 The left half of this unassuming storefront housed the original, pre-supermarket Loblaws store in the quiet southeast Ontario town of Lindsay in the 1920s and 1930s. The space has long been subsumed. 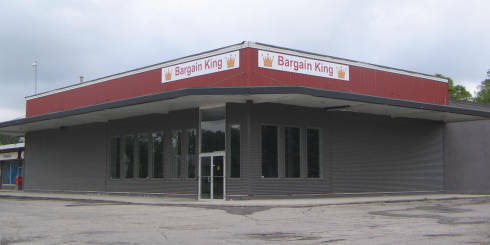 This downtown building in London, Ontario housed a Loblaws supermarket until the 1960s. I have a suspicion that the black and pale yellow tiling on the upper facade was also added by Loblaws, as it matches the colour scheme of their other mid-century stores. 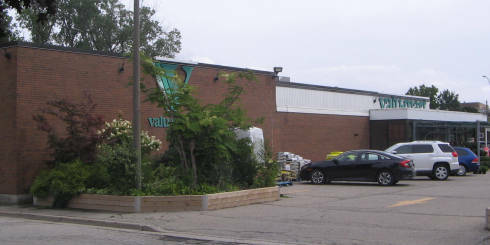 An early purpose-built supermarket, operating as Loblaws until the 1970s. 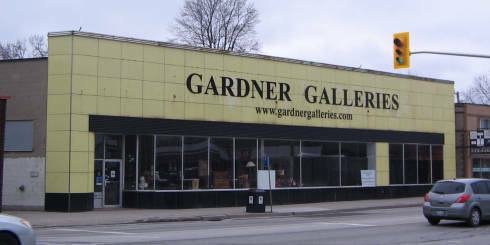 This store opened in 1952, and is a fantastically-preserved specimen clad in yellow porcelain enamel tile. 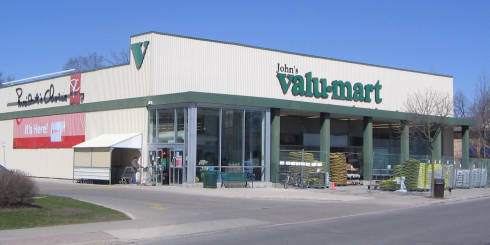 The structure was expanded after 1957 (the original west wall is still visible as an extra yellow pillar on the facade), and it operated as Loblaws until the 1970s. 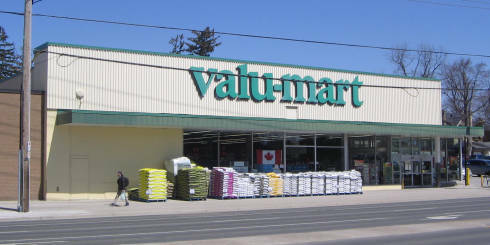 Opened 1950s as Loblaws; converted to Valu-Mart in the 1980s. Opened 30 Apr. 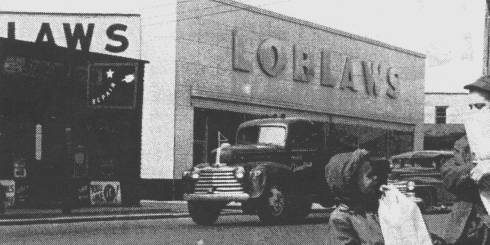 1959 as Loblaws; later Econo-Mart, Extra Foods, and No Frills. 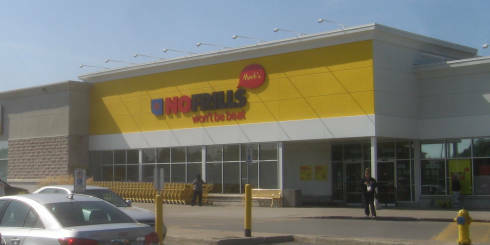 Opened 1959 as Loblaws; converted to No Frills in 1979. 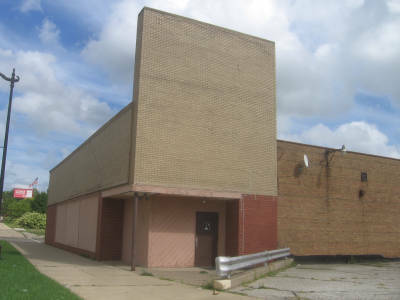 A short-lived store that opened in the 1960s and closed in the 1970s. 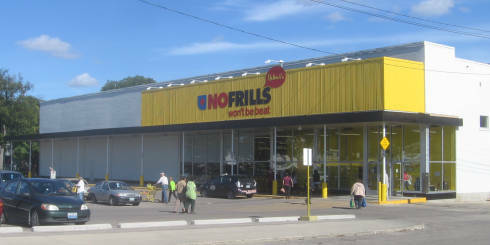 Opened 1970s as Loblaws; converted to No Frills in the 1980s. Opened ca. 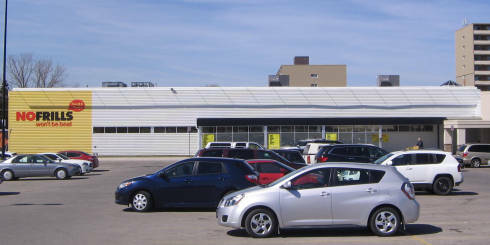 1975 as Loblaws; converted to No Frills in the 1980s. 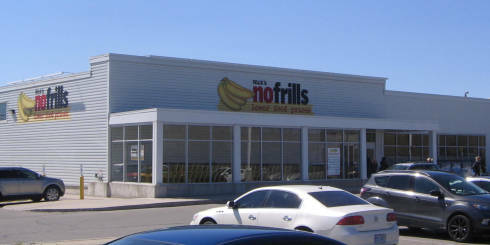 A rare appearance of the older No Frills "bananas" logo. I don't know the details about this store's provenance, but it's bound to be yet another former Loblaws location. Opened ca. 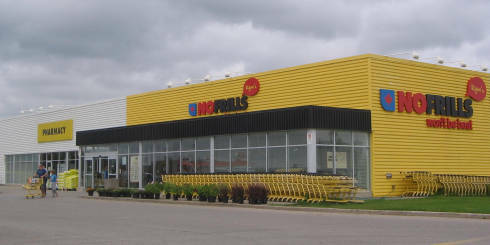 1990 as Loblaws; converted to No Frills in 2001. 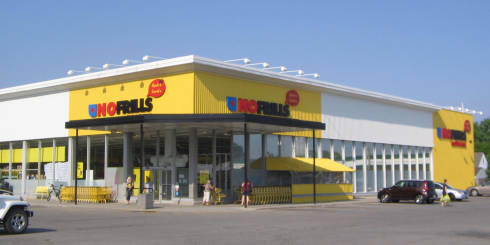 Opened 1996 as Loblaws, converted to No Frills in 2008. Opened 2005. 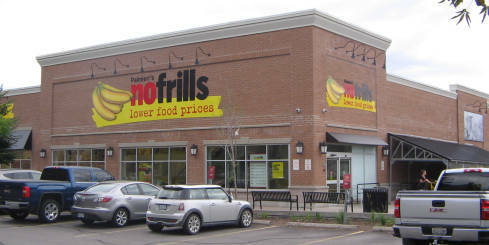 I believe this actually was a No Frills from day one. 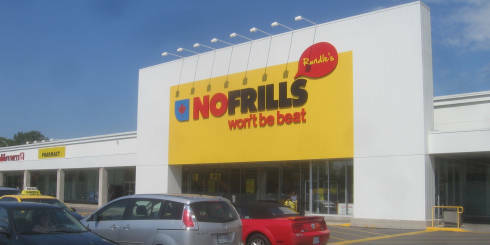 This store is on the large size, and I believe it also was actually a No Frills from day one. Built and opened in 2010. And yes: This was a No Frills from day one. This rather fancy-looking (frilly?) 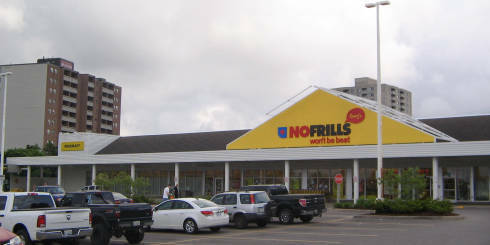 No Frills store opened on 9 Nov 2012. 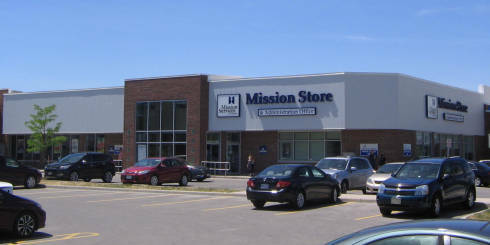 The entrance and parking area are located in the "back" of the building, while the "front" of the store facing the street is actually the back.